Originally taken place on September 26, 2009. 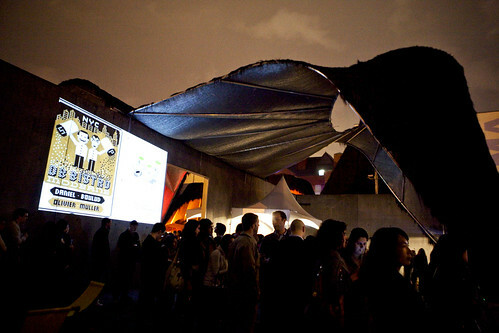 About a month or so prior to the Le Fooding event at P.S. 1, almost every major website (like NY Times’ Dining Journal and Serious Eats) wrote about them, pretty much bringing a lot of hype, arguably speaking, to this particular weekend. I was psyched to get some tickets for two main reasons: it was inexpensive ($30 for general admission) and you get to taste some food that’s not from the NYC area. Things is, when we (as in Helen, Seungmi, Michael and I) got there in person with our tickets in tow, we had to stand on line, outside in the chilly evening. Even we all got emails from Le Fooding that women shouldn’t wear heels (there’s grass and gravel on the courtyard and it’ll ruin your precious heels) but there were some wearing them anyway and some weren’t dressed accordingly to the weather that they’re shivering at every gust of wind. Very smart. Anyway, once we got through the gates, we discovered a Pandora’s box of chaos. Lines were snaked everywhere that we just grabbed the cheese plates first (they were the only table without a line), started to nosh on them and joined any line that seemed to be serving food that isn’t soup. We (more like Michael) met Chef Daniel Boulud near his restaurant’s stand for DB Bistro Moderne. 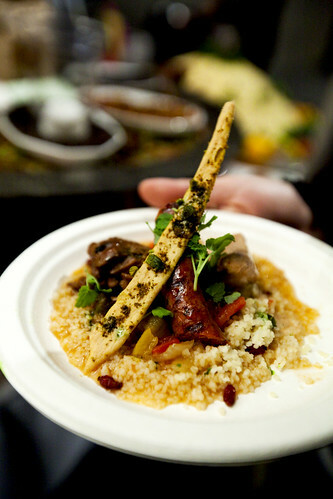 Their chicken and merguez sausage couscous dish was amazing and arguably the one who portioned out the most food. The chicken was cooked in sous vide hence its sublime texture. The small burgers dispensed from Minetta Tavern were good. Not the best I’ve had (I still heart Shake Shack) but something that’s been cooked for a huge crowd, it ain’t bad. It did have that aged funk taste from the burger. Quite juicy and cooked medium-rare when you do see the innards shot from the slideshow at the bottom of this post. The caramelized onions were a nice touch. The most interesting restaurant stand was from Paris’s Le Chateaubriand. First off, the line coiled inside out; you start from the center and you’ll walk your way outward. Secondly, it took a long time for the line to get moving. We found out that there’s a lot of components to this dish that it took five chefs to keep a batch of plates churning out to the awaiting crowd. It’s worth the wait though. I loved how tender and rare the steak was and the smoked eggplant and smear of goat cheese just balanced all the flavors out. The most insane line was the ice cream line represented by Greene Ice Cream. This was the longest wait out of all the food stands in this event. Probably we stood in line for a good 45 to 50 minutes. The reason behind it was the fact it’s really one young lady scooping over three to five hundred attendees. Damn… By the time we reached at the head of the line, it started to rain. We ran over to Seungmi’s father’s car to seek shelter and head home. Overall, the event was chaotic but the food was pretty good, given to the fact that these restaurants are serving a huge crowd of people. I learned over the Interwebs the day after the event was over that the VIP tickets ($60 with unlimited Champagne and you go there an hour earlier before the public) fared better. No one but those limited number of ticketholders to get your food. Next time, perhaps, that’s of course, if Le Fooding does come back to NYC. Slideshow after the jump or if you can’t see the slideshow (since you’re on an iPhone and it can’t handle Flash), here’s the Flickr set of this event. daaaamn, 45 minutes for ice cream! a bunch of these food events all look so delicious, but then i’m fearful of the mobs of people that go and the long lines.. :( those vip tickets sound ok though..